One of New Zealand’s nine listed Great Walks, the Tongariro Northern Circuit winds its way past Mount Tongariro and around Mount Ngauruhoe, the perfectly-shaped active volcanic cone known to movie buffs as the imposing Mount Doom in the Lord of the Rings films. Although currently dormant, Mount Ngauruhoe is New Zealand’s most active volcano, with the latest eruption being just over 40 years ago in 1975. The stand-out feature of the walk is the contrasting landscape. The walk itself takes between 2-4 days, depending on fitness levels, and it covers 43 kilometres. 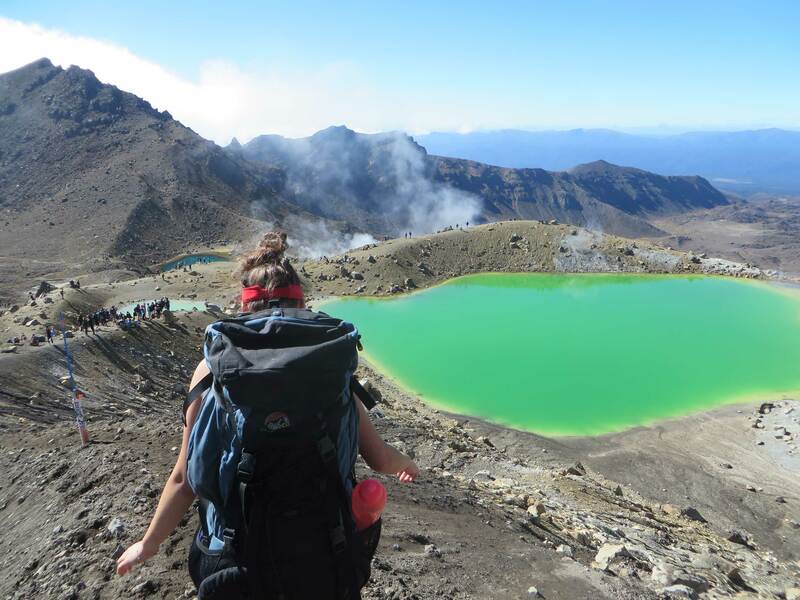 Most people find that three days is the optimum duration, giving time to enjoy the sweeping views and spectacular volcanic terrain of the central North Island whilst also providing a reasonable challenge and delivering a great sense of accomplishment on completion. Travelling in a clockwise direction from Whakapapa Village on the lower slopes of Mount Ruapehu, day one delivers an easy 8.5 kilometre walk (3 hours) along a well-maintained gravel path through native bush and across stream beds before opening out onto a barren scoria landscape. 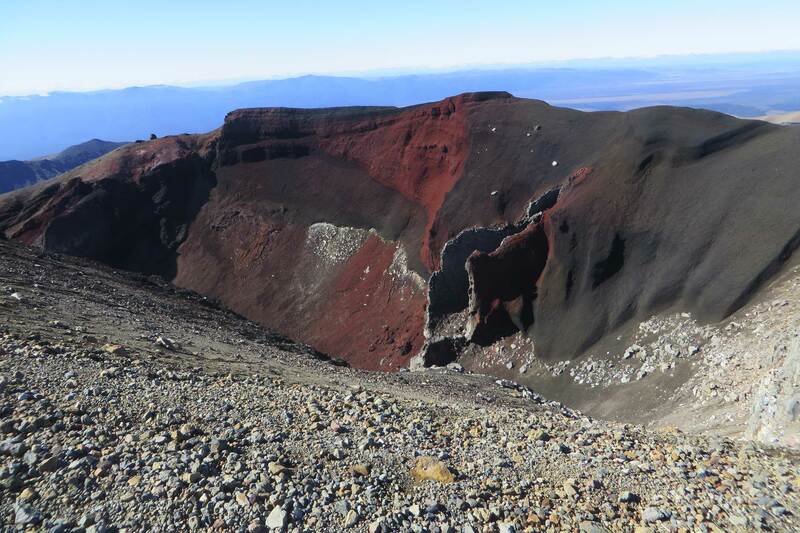 When nearing the overnight destination of Mangetepopo Hut, the imposing cone of Ngauruhoe and the flatter form of Tongariro loom into view, revealing a taste of the spectacular terrain that will be encountered next morning, after a night’s rest. Day two is definitely the hardest day of the circuit. Not for the faint-hearted, it involves completing a challenging 12.8 kilometre trek (5 hours), including trudging 700 metres uphill then 500 metres down. 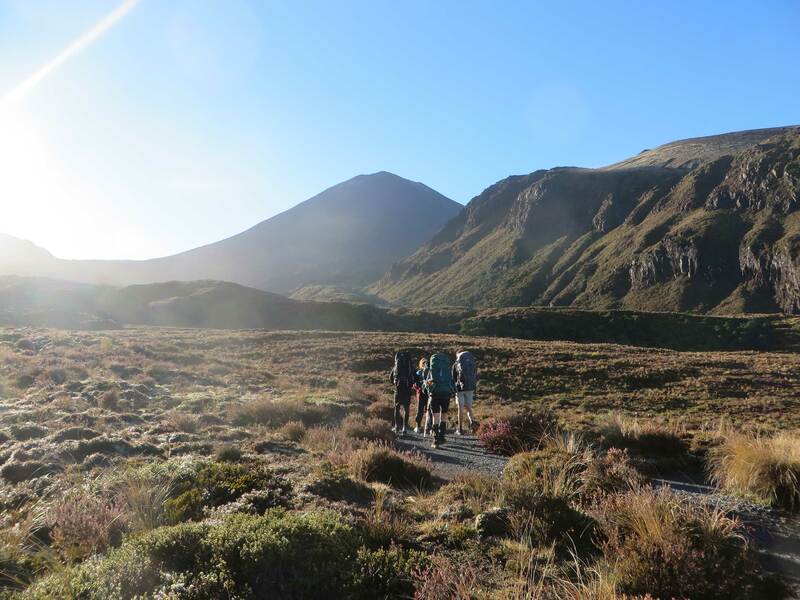 The first part of the day will be shared with those people doing the popular day walk of the Tongariro Alpine Crossing; this means crowds can be expected and setting off extremely early is a wise move. This part of the walk starts with a steep incline up what is aptly named the ‘Devil’s Staircase’ — a series of seemingly never-ending switchbacks and rocky stairs, where each step brings not only bodily pain but also ever-increasing magnificent views and a huge sense of achievement in conquering a section of the track deemed tough enough to warrant having its own (not so complimentary!) name. 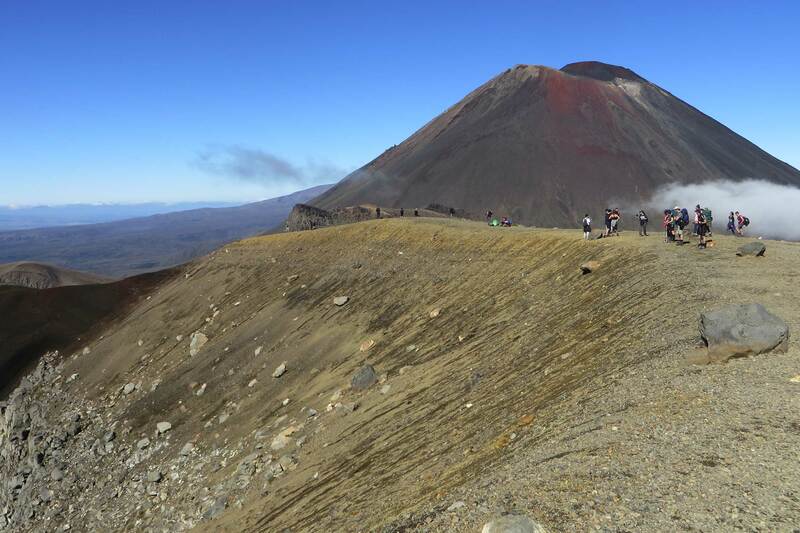 With lungs burning and legs aching, walkers will finally reach the pass between Mount Tongariro and Mount Ngauruhoe. 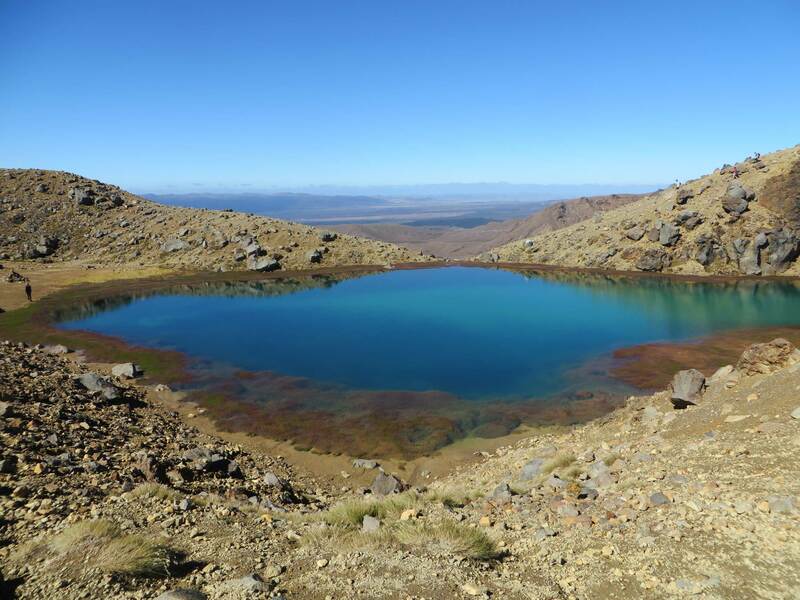 After a welcome flat walk and further climbing (chains are drilled into the rock to assist in places) walkers will be treated to views of the Red Crater, the three Emerald Lakes and the Blue Lake. This is the stage where full realisation that it was worth all the effort sinks in. No filters will be needed when posting photos of these lakes as their vibrant colours, made even more prominent by the stark contrast to the surrounding grey, volcanic rock, speak for themselves. After descending a scoria ridge down to the lakes, it is time to part company with the day trampers doing the Tongariro Alpine Crossing as they head off to their pick-up point further north. 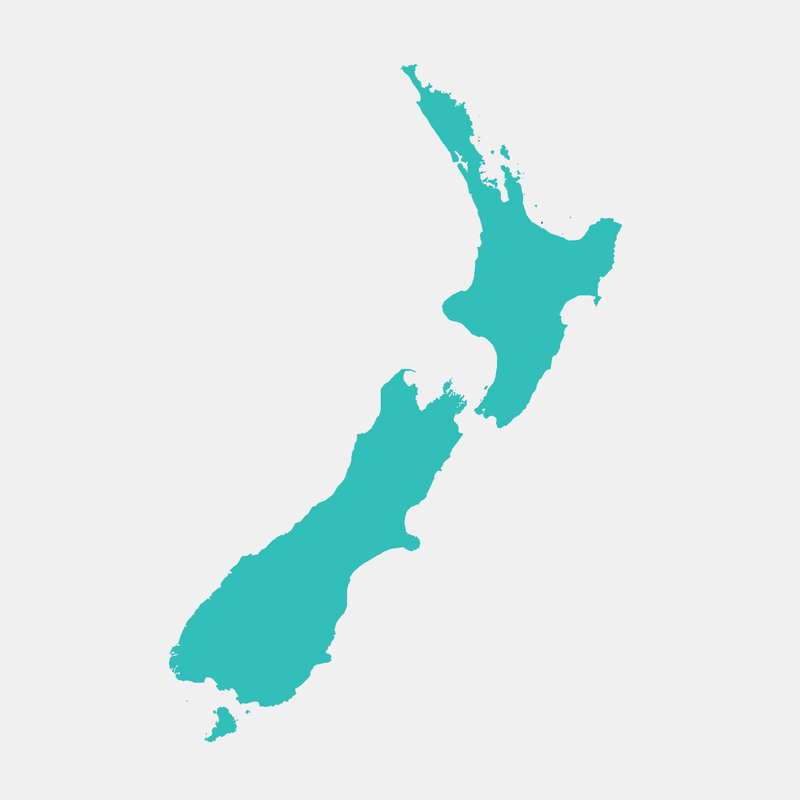 Instead, walkers doing the full Circuit, will descend steeply into the Oturere Valley. With an endless variety of unusual jagged lava forms created by early eruptions from the Red Crater, Oturere Valley is a magical place to visit, especially on a misty day. For those who have watched Lord of the Rings, it is here that they will find themselves glancing breathlessly around for a sighting of Golem or for Orcs crouching behind the rocky outcrops. Nestled at the far end of the valley is tonight’s accommodation, Oturere Hut. 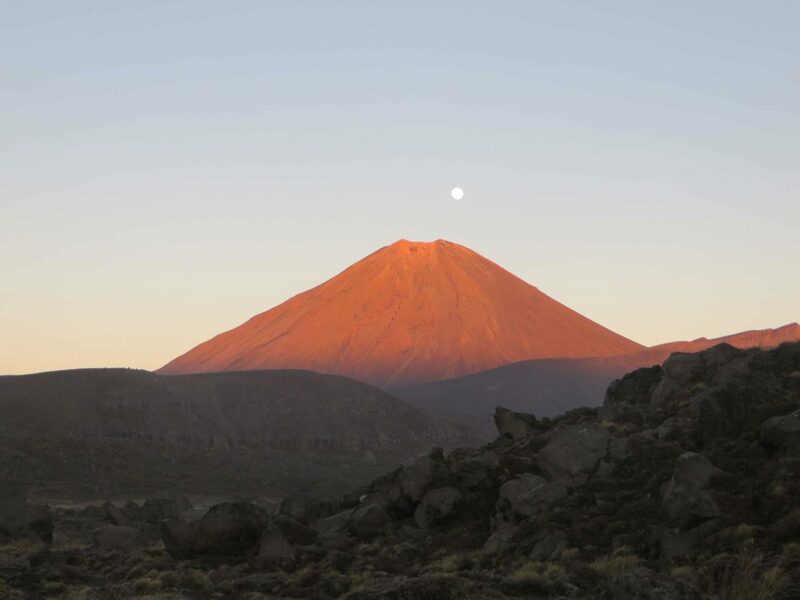 It is well worth getting up early on the final day to watch — weather permitting — the incredible sight of the sun rising in the east, changing the colour of Mount Ngauruhoe to a deep red as the moon slowly descends behind it. As the early morning mist lifts, today’s 21.8 kilometre journey (8 hours) begins by traversing a number of stream valleys and open gravel fields. The track sidles around the foothills of Ngauruhoe before descending into a beautiful beech-clad valley. Upon climbing up to the exposed and windswept ridge on the other side of the valley, spectacular views of Mount Ruapehu unfold, along with a sense of definitely being on the home stretch. For those who can still muster the energy, there are two very worthwhile side trips to be taken on this final leg of the journey. The first is to the Historic Waihohonu Hut and is only 10 minutes return from the main track. 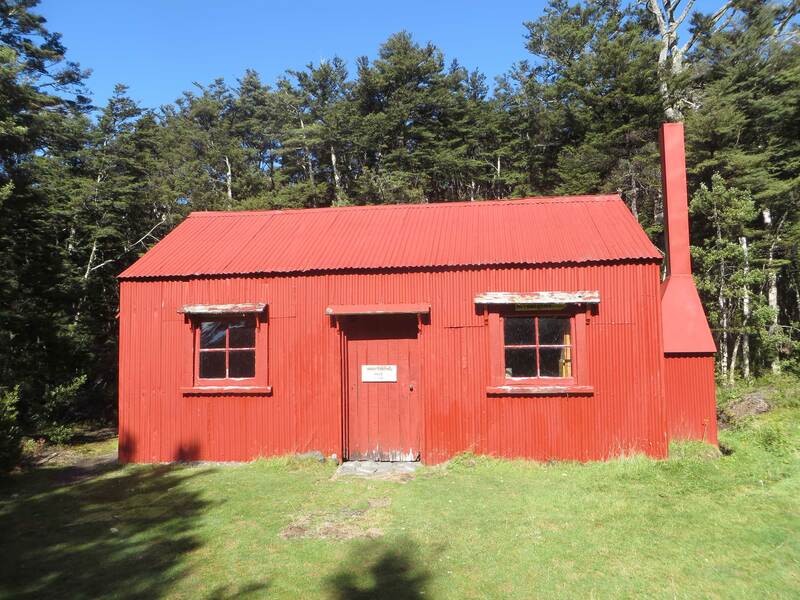 Built in 1904, this was the first hut built in Tongariro National Park and is the oldest example of a typical early two-room mountain hut in New Zealand. Staying overnight here is an option. The second side trip leads to the striking Tama Lakes, two infilled explosion craters. The lower lake is only 10 minutes from the junction, while the upper lake is up a steep ridge, taking 1.5 hours return. The final push, back to the starting point of Whakapapa Village, heads past the pretty Taranaki Falls before following the Wairere Stream through beautiful mountain beech forest and back to the village. As with all Great Walks in New Zealand, advance booking through the Department of Conservation is essential and proper planning is crucial. Be aware that the weather can change at any time; as long as the appropriate preparation has been undertaken, a memorable experience awaits.